Confronted by parts obsolescence and waning political support, the European Space Agency has shut down subsystem production lines for the Automated Transfer Vehicle as member states debate how they will contribute to future international space exploration efforts, according to top spaceflight officials. The huge cargo freighters, weighing more than 20 tons fully loaded, will stop flying in 2014 when the fifth resupply craft delivers equipment to the International Space Station. ESA member states decided to discontinue the program after briefly considering redesigning the throwaway cargo craft to return hardware in a hardened re-entry capsule. Three ATVs have launched since 2008, including a spacecraft now docked to the orbiting outpost. Two more spacecraft are due to launch in 2013 and 2014, and assembly of those vehicles has progressed enough to allow officials to shut down vendor production of the ATV's subsystems, according to Bob Chesson, a senior advisor in ESA's human spaceflight directorate. The parts for the two remaining ATVs are mostly delivered to assembly plants in Italy and Germany, where the spacecraft's two main components are integrated. 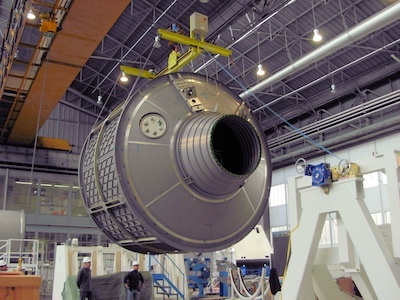 "If we wanted to reopen production lines, there is a significant obsolescence problem at the equipment [and] component level," Chesson told Spaceflight Now. ESA launched the $2 billion development of the Automated Transfer Vehicle to pay the agency's share of the space station's common operating costs. Instead of exchanging money, the space station's partners prefer to arrange barter agreements to pay debts for operating costs and launch services. Each ATV mission costs about $600 million. 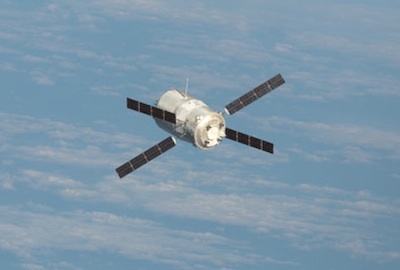 Five ATV flights pay off ESA's operating cost burden until 2017. With the space station program extended until the end of the decade, ESA now owes approximately 450 million euros, or about $600 million, to meet its commitments between 2017 and 2020. ESA managers are consulting the agency's member states on the alternatives to pay their share of the station's operating costs. Officials expect representatives of the member states to decide on an option, or barter element, at a ministerial council meeting in November. One option, tentatively favored by Germany but dismissed by Italian and French space officials, is to sign an agreement with NASA to supply a service module to the Orion crew capsule, or multipurpose crew vehicle. The service module would be based on the ATV's propulsion section. Germany is Europe's largest contributor to the space station program, followed by France and Italy. Engineers in the United States and Europe are studying the scenario. Lockheed Martin Corp., the Orion spacecraft's manufacturer, is currently on contract to build the vehicle's service module. 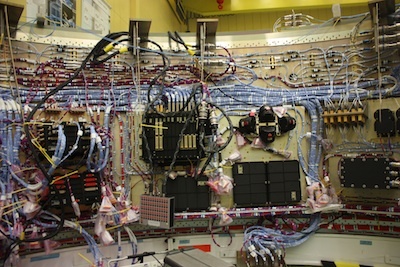 The ATV service module is built by Astrium Space Transportation. Chesson said any derivative of the ATV will require major upgrades and a redesign of the avionics system to ensure modern components are commercially available. Such changes could put upward pressure on the cost of a follow-on to the ATV. The ATV consists of the service module and a pressurized cargo carrier, built in Italy by Thales Alenia Space, to haul supplies, propellant, water and breathing air to the space station. The robotic spacecraft is the largest resupply vehicle flying to the space station after the retirement of the space shuttle. It is capable of transferring tons of rocket fuel into the outpost's Russian segment, reboosting the lab's orbit, and delivering hundreds of bags of food, clothing, experiments and other gear. Bill Gerstenmaier, NASA's associate administrator for human exploration and operations, said the space station's demand for propellant will decrease in the next few years, curtailing the program's need for a large fuel-carrying freighter like the ATV. "That's allowed us to essentially fill up the propellant tanks aboard the space station, so at this point, the unique capability of the Automated Transfer Vehicle to carry propellant is not needed," Gerstenmaier said in March 28 testimony to the House Science Committee. Commercial flights by U.S. spacecraft will make up the rest of the lost capacity with the end of the ATV program. Acting as the space station program's chief integrator, NASA plans to request the Japan Aerospace Exploration Agency to order more H-2 Transfer Vehicles to cover that country's slice of the lab's operating costs. JAXA is developing a returnable version of the HTV to fly as soon as late 2017, assuming funding to develop the modified spacecraft clears Japanese government budget-writers. If approved, the re-entry upgrade, called HTV-R, could enter service before the end of the decade, bringing back to Earth up to 3,500 pounds of cargo on each flight. "HTV provides a unique capability," Gerstenmaier said. "It can carry external cargo, which is important to us. It also has a large hatch where you can carry full research racks across to the space station." Gerstenmaier told lawmakers NASA would like to have four HTVs fly after 2015. The last of seven HTVs currently on contract would launch in 2016, so two or three additional missions may be required through 2020.